Large, sedentary and dark-eyed, and sometimes loudly vocal with a “Who-cooks-for- you” call. 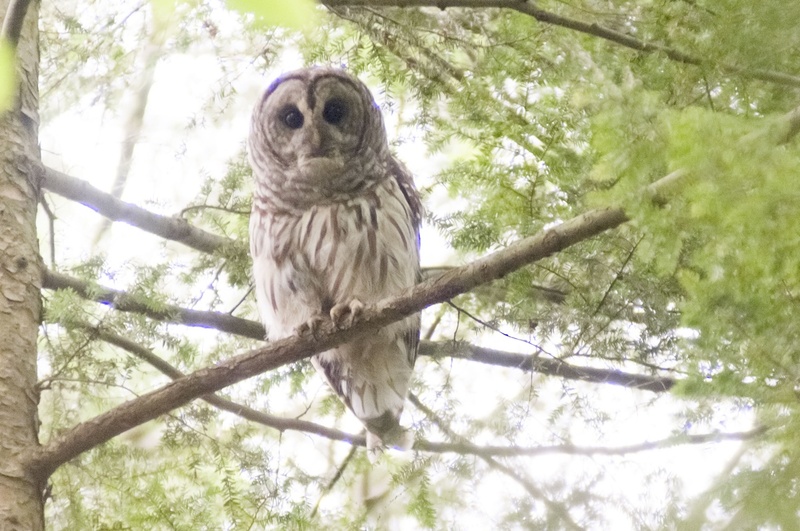 Originally an Eastern bird, now spread to the Pacific Northwest and sometimes competing with Spotted Owls. Mottled brown, without ear tufts, and short, rounded tails. Often found perched in large trees in mature mixed forests, often near water; these areas are more likely to have cavities for nesting and a diverse range of prey, especially small mammals, birds, reptiles, fish and invertebrates. Pairs likely mate for life, and use largely unmodified cavities for nesting. Sometimes predated by Great-horned Owls. Lifespan up to 24 years. Population ~ 3 million and increasing.